Pour me a drink, my head is spinning! I got to celebrate — a girl! You’ve got to decorate a pearl. Tie her a bow of scarlet ribbons. We’ve got to crown a tiny curl. I got to welcome me a girl! She is my baby sister, more than five years younger than I am. Alone of my younger brothers and sisters, she is the one whose birthday I don’t remember. She was very ill when she was born, and our parents tried to prepare us older ones for the chance that she wouldn’t survive. So it’s not the day she was born that I remember. It’s the day she came home, the day I got to hold her for the first time, the day I first knew that she — like our older sister Diana — would be my best friend for life. And late last night, in Virginia, my baby sister, who’s always been called Kacy, became a grandmother for the very first time. Second, when Kacy and I first talked about what it would be like for her to be a grandmother, back when Ian himself was a baby, it never occurred to either of us that the very first thing I would do when I got the word about Isadora’s birth — after letting other family members know — was carefully enter her name, birthdate and birthplace in my genealogy database, carefully and neatly linked to her parents (and, yes, Elizabeth, honest! I entered the text message as a source citation!2). 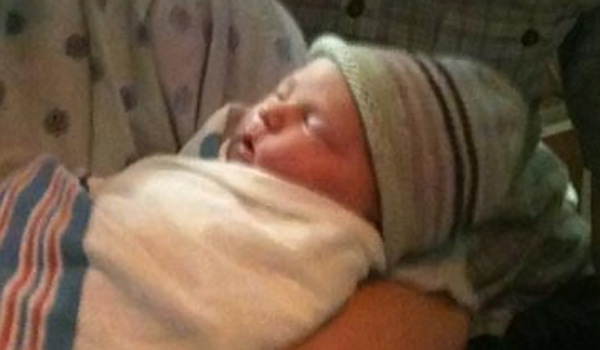 Me… I love being a great aunt (now for the fourth time). But I sure as hell hate being old enough that my baby sister is a grandmother. A wonderful story of a miraculous event, Judy – make sure you also copy/paste this column into her Notes section as well!! Congratulations, you GrandAunt, you!! Thanks, Celia! We’re pretty giddy today, that’s for sure! Oh, Judy…this one got me a lil teary…and she is absolutely gorgeous!! Congratulations to your entire family…she’s a lucky little girl. We’re all a little teary today too — but with joy! Congratulations to all Isadora’s extended family! Congratulations! What a beautiful baby – but then you already knew that (grin) Adding babies to the data base is one of the best parts of genealogy! Isn’t it just the coolest part! Gotta love them babies. Congratulations on the new addition. Of course you will be the greatest aunt! I had a grand aunt named “Lilly”, and she was one of the best sources of love I got in my childhood. Her husband, Paul Yankee, was just as nice and is the namesake of my father. I am sure you will shine all your brightness on this baby girl. Thanks for sharing, Paul. Thanks, Paul — we’re over the moon with this little one, as you can imagine! What great news, Judy! I’m very impressed that she has already been sourced and cited. Now you just have to hang onto that text message for, well, ever, I guess. Congratulations to the whole family, but particularly to Isadora’s greatest aunt! Thanks, Barbara! As you can imagine, we’re downright thrilled. She’s such a gorgeous little thing! Congratulations great Aunt Judy! You sound so excited I couldn’t help but just grin when I read this! “Excited” is a good word. “Over the moon” would do it too. Thanks!